The president, Donald Trump has used the social network Twitter to criticize Guatemala, Honduras and El Salvador for not doing “absolutely nothing” by the United States when it comes to stem the outflow of migrants , despite the fact that “EVERYONE has been taking American money for years”, in the form of the development aid that he has ordered cut. Yesterday , the president ordered Mexico to “use its harsh immigration laws to stop the thousands of people who try to enter the United States.” And he criticized the Government of Andrés Manuel López Obrador for “not doing ANYTHING” to avoid it. He also threatened that his Department of Homeland Security would soon cease to be “soooo nice” to the neighboring country, just as he had threatened to close the entire southern border earlier this week. The White House spokeswoman, Sarah Sanders, has indicated however in an interview on the Fox network that Mexico “is taking a step forward and taking a greater sense of responsibility” on this issue. Nielsen has announced the shipment of 750 employees of the Customs and Border Protection agency (CBP, in English, on which the Patrol depends) to the border, in addition to seeking reinforcements in other areas of the Department of National Security, until a total of 2,000 reinforcements. He indicated that it will require those who request asylum to wait in Mexico to know if it is granted, a policy that is already underway, albeit on a very small scale, and that Nielsen wants to expand “hundreds of immigrants a day” even though the Mexican government he does not seem willing; since it is also being examined in the courts of justice. 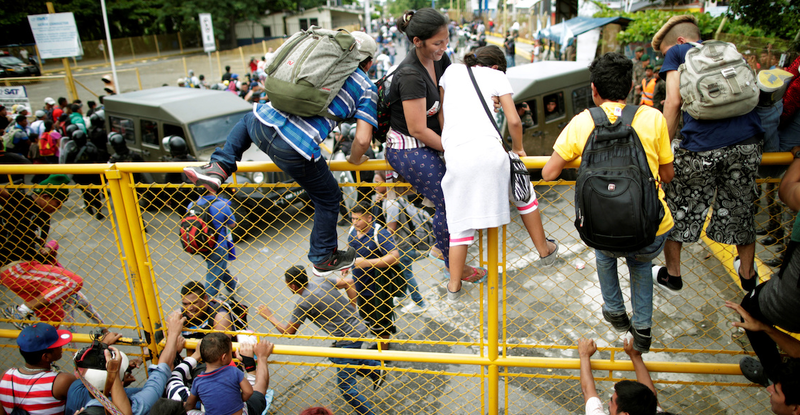 Since mid- October 2018, thousands of migrants, mostly Hondurans and Salvadorans, began a group exodus to feel more secure during their passage through Mexico, with the goal of reaching the United States. Thousands of undocumented people cross the Mexican territory every year towards the United States, but during the crossing they are exposed to robberies, extortions, kidnappings and even murders by criminal gangs, as well as abuses by corrupt authorities. On March 23, a caravan made up of more than 1,200 migrants began a trek through southeastern Mexico after spending two months stranded in the state of Chiapas waiting for the authorities to grant them a visitor’s card for humanitarian reasons. Some NGOs, such as Pueblo Sin Fronteras, have denounced that the Mexican Secretary of the Interior, Olga Sánchez Cordero, legitimizes the “severe” immigration policy in the United States. Given the information of these groups of migrants, Trump insisted last Friday on his threat to close his southern border with Mexico and warned that he could do it this week if the neighboring country does not “immediately” stop all illegal immigration.